A $2.45 million is what the Wilmington Police and the family of the Student killed by police agree to in a sttlement, the student Peyton Strickland was suspected of robbing another student of his PS3’s on releasse day in PS3. – PlayStation 2 images working fluently; Saving possible! CF3B5 releases PS3 Proxy GUI, it allows you to install PS Store games and demos via PC. Support for PlayStation 2 games with optional and mandatory installs. Team Slump release their i.load ISO Loader, it comes in a passworded RAR and no password is given. Registering (pair) Bluetooth devices has changed, and it is now possible to register more devices. Ability to play DivX and WMV files that are 2 GB or larger. Support of XviD files updated, many more files are now playable but are recognised as MPEG-4 files. Ability to display subtitles when playing DivX files. Ability to resume playing a DVD/BD from the point where previously stopped, even if the disc is removed then re-inserted to the console, or the console is turned off entirely. BD-J format disc is not supported. Ability to display an image while editing a playlist. Ability to play a music track while editing a playlist. BD discs recorded with BDMV format are not supported. Ability to copy playlists created in (Photo) and (Music) to a PSP system. Blu-ray BD-Live Profile 2.0 is now supported. Users are now able to use several interactive features such as downloadable video content, ring tones and interactive movie-based games, with Profile 2.0-compatible Blu-ray Discs. The interactive features may vary depending on the disc. Ability to now play BD-R version 1.2 (LTH* BD-R) discs. LTH, or low to high, is a recording method that supports organic dye, write-once BD-R media. Ability to change some PS3 system settings during remote play. [Save Target] has been added as an option under [File] in the browse mode menu of the Internet browser. This option adds the capability save a file that is linked from a Web page, such as an image or video file, or other type of file, to your PS3 system’s hard disk drive or storage media. The Internet browser now displays some Web pages faster. Using the Internet browser, it is possible to play a linked video file as it is being downloaded (Some types of video files cannot be viewed in this manner and must be downloaded completely before playback). Other OS Wake-On-Lan support was added. We have found out that there has been a possibility of unauthorized access to personal information on the PLAYSTATION®Store through PCs, a content download service of the PLAYSTATION®Network. Although unlikely, it is possible that the passwords of a small percentage of PLAYSTATION Network users may have been changed through unauthorized access, making it possible to view users’ personal information and/or use the Wallet for the PLAYSTATION Store. PLAYSTATION Network accounts do not display entire credit card numbers. We have investigated the extent of unauthorized access and possible alteration of passwords that could have occurred before corrective measures were taken, and are directly contacting customers who may have been affected by this incident. In order to verify that your account is intact, we strongly suggest that PLAYSTATION Network users sign in to the service. If you can successfully sign in with your pre-set password, your account is not affected by this incident. Saw the first real PS3 hard modification, a PS3 laptop created by Ben Heck. After about three videos and loads of people realising his exploit was fake, Spiker announced that he was “leabving the scene” and that he gave his “work” to other hackers. The PS3 system does not support playback of DTS-ES and DTS 96/24 for DVD-Video or DTS-ES Matrix for Blu-ray Discs. Easier navigation – PlayStation Store’s new interface allows easier navigation. It is now possible to move between pages by simply pressing the X and O buttons,as well as move to other pages faster. New layout – PlayStation Store has a new page layout that makes it easier to find locate content. Avatar display – View your PlayStation Network account avatar on the pages of PlayStation Store. Content status display – An icon now indicates the status of each content item: Items that are purchased and Items that are in the cart. SCE announce that Home is delayed again. XVISTAMAN2005 discovers a way to install Debug(DEX) Firmware on Retail(CEX) PS3’s, the method makes you swap harddrives and if you dont know what you are doing, is extremly dangerous as it can cause permanent bricks. “We’re excited at the opportunity this presents and look forward to more and more games to be enhanced with YouTube”. PS3 Tool Chain is released. Greenpeace release a report stating that the PS3 is full of hazardous chemicals, in the report called Playing Dirty, they found the PS3 contained high leveles of bromine and PVC. Sony announce an “introduction of dynamic in-game advertising on PlayStation 3”, this means advertisers can aproach Sony and have their product seen in a PS3 game. IBM releases info on their Roadrunner SuperComputer which is powered by almost 13,000 PS3 Processors. Improves the playback quality of some PlayStation format software. An option to automatically turn off the PlayStation 3 system after a system update has completed has been added. For DTS playback on DVD-Video and Blu-ray Disc media, DTS-ES and DTS 96/24 for DVD-Video and DTS-ES Matrix for Blu-ray Discs are now supported. New sorting options have been added for items in the [Video] category. The ability to print a photo playlist has been added. Support for MP3 Surround format audio has been added. Video content stored on the hard drive can now be upscaled to HD quality. The ability to access the XMB while playing PlayStation 3 format software has been added. Only some of the XMB functions can be used during gameplay. A long press on the PS button displays the standard menu with options to quit the game, turn off the system, change controller settings etc. The XMB screen cannot be displayed when playing certain PlayStation 3 format software titles. Music playback is only available in games where the developer has enabled the feature. Players can now collect PlayStation Network Trophies in games that support the feature. An [Internet search] option has been added to the XMB. When using a keyboard, the entire text entry field can be cleared at once. The [Information] screen for friends has been redesigned and renamed as [Profile]. New page added to profile of users under [Players Met] which shows the last game played with that user. Ability to record TV programmes using PlayTV while playing a game. Various fixes for issues caused by update 2.40. Seen the release of the first Blu Ray Java homebrew, this utilised Blu Ray Java from BD Discs, to enable us to use Java homebrew on the XMB. Improves the playback quality of some PlayStation 3 and PlayStation format software. At Leipzig Games Convention saw Sony announce a 160GB SKU, which would be bundled with Uncharted:Drakes Fortune and a DualShock 3 controller, along with a voucher to download the PSN game Pain. Sony launches Life With PlayStation, whcioh combine folding@home with various other applications. SKFU manages to partially dump the Ram from a retail PS3. English newspaper The Sun reports on a weird news story, regarding the theft of £600,000 worth of PS3 games. The games were stolen from a parked lorry whilst the driver was sleeping, the police manage to get the games back, where they are locked up in police secure holding, where they are yet again stolen. “Project Mersenne” is a attempt to “Crack” the PSN cards , and Beta keys at all. At first sight this might sound like a fraud attempt. However, it is not and in most country’s it is legal. But more important, financial gain is NOT our goal. Deeper understanding of PSN ampersand a intellectual challenge will be our reward. Who knows what we will find out? The PS3 and/or wireless controllers can now be set to turn off automatically after a set period of inactivity. The PS3 can be set to automatically turn off after a background download or installation of content has completed. The [Cinema Conversion] and [Upscale] options under [Video Settings] have been renamed to [BD/DVD Cinema Conversion] and [BD/DVD Upscaler]. [50 Hz Video Output] has been added as an option under [Video Settings]. [DivX VOD Registration Code] has been added under [System Settings]. This code can be used to register the PS3 to be able to play DivX VOD files. The method for reconnecting bluetooth devices has been modified. [German Keyboard (Switzerland)], [French Keyboard (Canada)] and [French Keyboard (Switzerland)] have been added as options under [Accessory Settings] > [Keyboard Type]. A scene-search feature similar to the version on the PSP has been added. This feature allows a video or PlayTV recordings to be broken up into 15, or 30-second; one, two, or five-minute intervals, which can then be accessed quickly. The option to have videos under the [Video] section of the XMB home menu play in sequence has been added. A [Mosquito Noise Reduction] setting has been added which reduces noise on videos saved on the console’s hard drive or external storage media. Volume control now has nine levels instead of five. A pause button has been added to the mini music control panel on the XMB. Frame Conversion has now been removed for MPEG-4 videos. Anything other than 50 Hz will now be displayed in NTSC, showing up in black and white on legacy PAL systems that are incompatible with the NTSC video standard. Pressing the PS button during a video now pauses the video, rather than continuing playing it. In-game Screenshots, which allows screenshots to be taken while playing a game, has been added. This feature will be supported on a game by game basis. The [Settings and Connection Status List] option under [Network Settings] can now be viewed on the In-game XMB menu in some PS3 games. The PlayStation Network Sign-Up and Account Management utilities have been redesigned. The method of disabling the automatic sign-in option and the way to sign out from PlayStation Network have been modified. Information has been added below the avatars of offline Friends in the Friends list indicating how long it has been since they were online. A “redeem codes” option has been added directly in the PlayStation Store to make it easier to redeem PlayStation Network Cards and promotion codes. The Internet Browser now supports Adobe Flash 9 content. Items on the Information Board can now link directly to an item in the PlayStation Store. The PlayStation Trophies interface has been modified to show the percentage gained towards the next level in addition to the current level when viewing profiles or comparing trophies. The official PS3 Bluetooth headset is now supported and a “high-quality (HQ)” mode, which allows higher-clarity voice communication, has been added for this headset. An on-screen indicator showing headset battery status, volume level, and whether HQ mode is active has been added. The on-screen notification displayed when the player gains a trophy now displays the specific trophy icon created by the game’s developer. Support for network printers has been added. HP printers are now supported. A recovery mode has been added. FreeplayPSP(FreePlay) releases UnBar, which extracts .BAR files from PS Home Beta. The playback quality of some PlayStation 3 format software has been improved. A text entry issue that occurs when using the on-screen keyboard, USB keyboard or Bluetooth keyboard with some PlayStation 3 format software has been addressed. Internet browser now supports full-screen display of Adobe Flash content. Support for Live movie (using RTMP format) playback has been added. Embodiments of the present invention may be used in emulation of any target system having a secondary processor that cannot modify its own instruction memory. Target systems include, but are not limited to general purpose computer systems and other programmable devices, such as video game console devices. By way of example FIG. 3A depicts a block diagram of an example of a target system 100 in the form of a game console device, a Sony Playstation®2. PlayStation is a registered trademark of Sony Computer Entertainment Inc. of Tokyo, Japan. In this example, the target system 100 is built around a main processor module 102 referred to as an emotion engine, a Graphic Synthesizer 104, an input/output (I/O) processor (IOP) 106 and a sound processor unit 108. The emotion engine 102 typically includes a CPU core, co-processors and a system clock and has an associated random access memory (RAM) 110. The emotion engine 102 may perform animation calculation, traverse a scene and convert it to a two-dimensional image that may be sent to the Graphic Synthesizer (GS) 104 for rasterization. As shown in FIG. 3B, the EE 102 may include a CPU core 122, with an associated floating point unit (FPU) coprocessor 124, first and second vector co-processors 126, 128, a graphics interface controller 130 and an interrupt controller (INTC) 132. The CPU 122, vector co-processors 126, 128, GIF 130 and INTC 132 may be coupled to a 128-bit main bus 134. The FPU 124 may be directly coupled to the CPU 122. The CPU 122 may be coupled to a first vector co-processor (VU0) 126, which is, in turn, may be coupled to a second vector co-processor (VU1) 128, having an instruction memory 129. VU1 128 is an example of a secondary processor that cannot modify its own instruction memory 129. 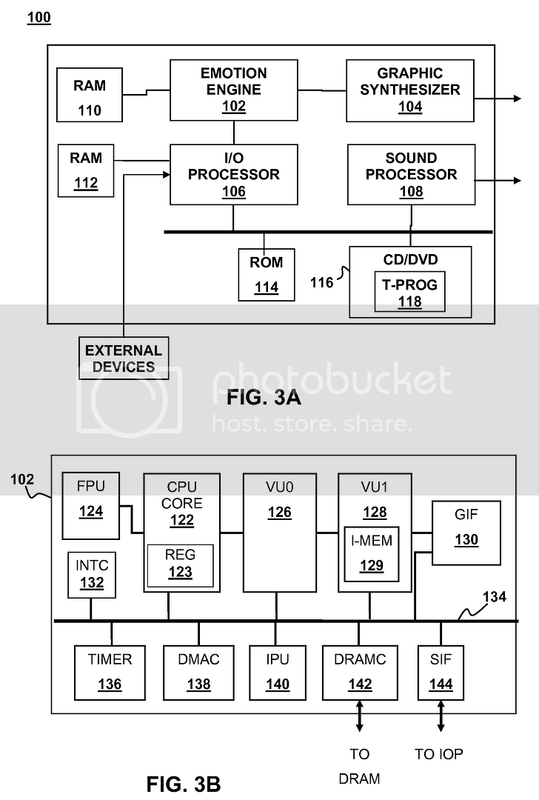 The second vector co-processor VU1 128 may be coupled to a graphics interface (GIF) 130. The EE 102 additional may include a timer 136, a direct memory access controller (DMAC) 138, an image data decompression processor (IPU) 140 a DRAM controller 142 and a sub-bus interface (SIF) 144 that facilitates communication between the EE 102 and the IOP 106. StreetskaterFU(SKFU) releases information about the vulnerabilities in PS Home, you can read about it here. Scientists at both University of Alabama and University of Massachusetts reveal that that they have solved a mystery about what speed vibrating blackholes stop vibrating at, using a 16 PS3 cluster.